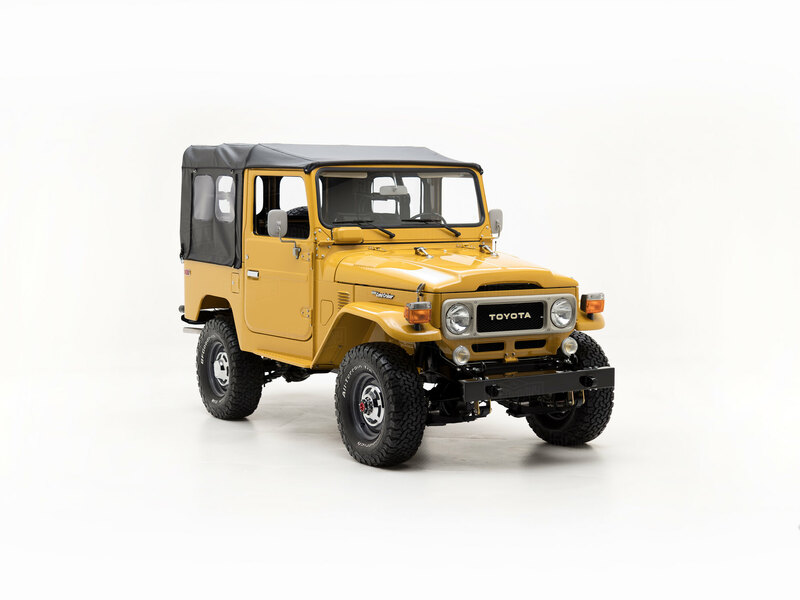 Classic and versatile, this custom-built FJ40 was released into the wilds of Wisconsin! Nothing really compares to a soft top in the summer, except for a bikini top - and this lucky 4x4 just happens to have both. The Expedition Bumper by The FJ Company supplies plenty of off-road attitude, and its four BFGoodrich® All-Terrain tires make you believe there's no place you couldn't go. The classic Toyota 2F engine with 5-speed transmission gives this ride plenty of go - enough to power through dirt roads, and rush-hour traffic. Old Man Emu suspension smooths out the ride, and revitalized front disc brakes ensure you'll stop on a dime - or a quarter. Inside the cabin, black on yellow makes for a nice contrast, while classic gauges and knobs take you back to the eighties and beyond. Black vinyl seats keep things stylish and utilitarian while the classic-looking vintage radio plays your favorite playlists.